Would like to get a copy of your film. Sent e-mail, but got no response. It's been many years and I didn't know everyone, but I do remember there was this 13-14 year old wonder-kid who could play the trumpet really well. Are you that person? The LAPD Jr. Band was one of the first bands to adapt what would become known as “corps style’, but now days the drum corps are becoming “band style”. I recently read an article about how the modern day drum and bugle corps using B flat brass instruments sound like marching bands. The author, a Mr. John Simpson who is an expert on the subject of brass instrumentation explained in layman terms how the concept of over tones work with G instrumentation verses B flat. His article further explained that the lack of that over tone sound which is produced by a G bugle in most cases is the appeal of listening to a drum and bugle corps in the first place. He also believes that the lack of that sound that drum corps of the past produced is now a contributing factor to the demise of the popularity of the drum corps activity. He recommended that altering the valve on B flat brass instruments (holding down the third valve and pulling the slides on the first and second valve) which could produce the sound close to that of the G bugles to bring back the appeal of performing or watching a drum corps. This would be cost cutting measure also because it doesn’t require the purchasing of new instruments, just the modification of existing ones. Although I could always hear that distinct difference in the tone of a horn-line using those G bugles I never understood why that was the case. Although I am a percussionist, the trumpet is my favorite instrument. I contacted Mr. Simpson and he sent me a few of his recordings playing a G baritone bugle. His playing is extraordinary. I informed him that our small drum corps would continue to use G bugles and we welcomed any advice or suggestions he would be willing to offer and he was cool with that. When I told him the story of the days our marching band was behaving like a drum corps he suggested that I share the story, so here it is the way I remember it. If I don’t have it all the way right, hopefully some of you former members can set it straight, especially those of you who joined drum and bugle corps after participating in the band. Back in 1970 our band was losing some of our best performers to the areas many drum and bugle corps. This had been going on for years. One of the biggest complaints of the day was why we couldn’t have females in the band like all the other bands and drum and bugle corps out there? Could one of the major reasons some members were leaving the band was because they wanted go where the ladies were? Perhaps, but realistically though, the major appeal to join a drum corps was most likely that distinctive look they had and more than anything else the sound, that blaring sound and that I can’t explain it sound. Did I mention the sound? Although not considered the best drum and bugle corps back-in the day in terms of the score sheets, one of my all-time my favorite drum corps will always be the Lynwood Diplomats. They had that sound. They were playing Santana’s “Evil Ways” (well-arranged and very cool) while a championship drum corps was playing the Mickey Mouse Club theme song (so un-cool). A corps could play the Mickey Mouse Club theme song and excite an audience because the song didn’t matter because it was all about that sound. When our captain (a snare drummer) of the drum section announced that he was leaving the band to play cymbals with the Kingsmen D&B I supposed our director officer Paul Hord figured enough was enough and that’s when he came up with a brilliant idea to keep a hold on his members. He went and recruited some female police explorer scouts to carry some colorful flags.Then Officer Hord re-arranged our music so, that our band would sound like a drum and bugle corps. The lead trumpeters used the same style of playing that you would hear the buglers using in the drum corps with solos in two and three part harmony. They would omit and skip around notes that were in the original arrangement to imitate those melodies buglers played due to the note limitations of their one valve piston rotor bugles. We had cut up our original tenor drums the year before and converted them to timp-toms. This gave us that melodic rhythmic quality to provide musical drumming verses banging. There were many marching bands back in the day and although common to drum corps we were one of the first marching bands to acquire the use of them. We tried marching drums in front in a couple of parades like drum corps, but that was quickly dismissed for obvious reasons. We next changed our field formations to match that of drum corps. 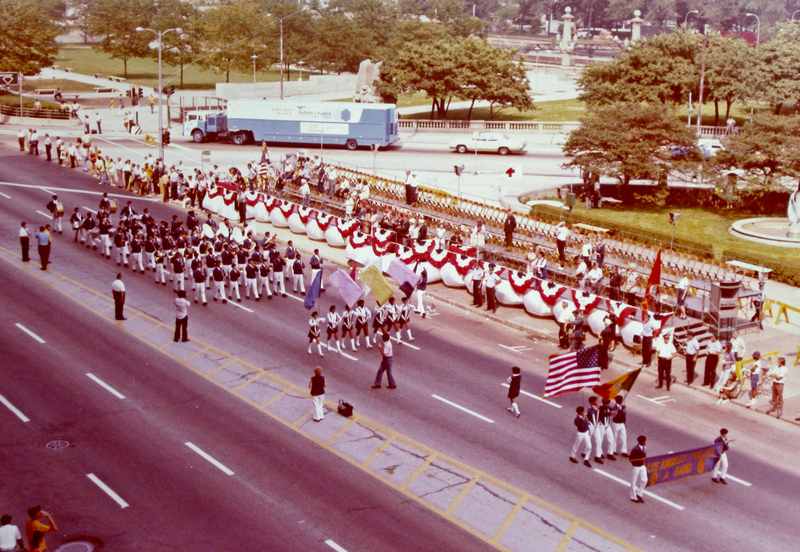 In 1971 as the result of winning the National Band Championship, we opened the American Legion National Drum and Bugle Corps Championships playing the national anthem and performing our field show in the Houston Astro-dome (a big deal back then) with what has become what is now commonly referred to as corps style band. All that is missing from today’s drum corps are wood winds and that extraordinary sound of the saxophones. With the use of keyboards, members singing and even the use of bass guitars in the modern drum corps, I believe it won’t be long before the wood winds start showing up. When these woodwinds are eventually added to the top drum corps they are going to sound like the LA Police Junior Band of over forty years ago before the band attempted to sound like a drum corps. It's great to see so many of you around that still remember all of the great times we had. Again I was a member of the color guard from 1964 to 1968, commanded by Dennis Zambrana, under Officer Kelly (I forget his first name) and later under Officer Paul Horde. When Dennis Zambrana left and joined the air force, eventually I became the commander of the color guard. I remember our color guard coordinator last name was Wallace. Then there was Lester Smith on trumpet. Who could forget him. Yes, let's not forget those big jail buses, picking us up for practice at the park and then dropping us off to go home. There was one time the buses could not be used because of the riots. During that time school buses were used. Someone mentioned parades. I attended LA High School and was a drummer in the band. 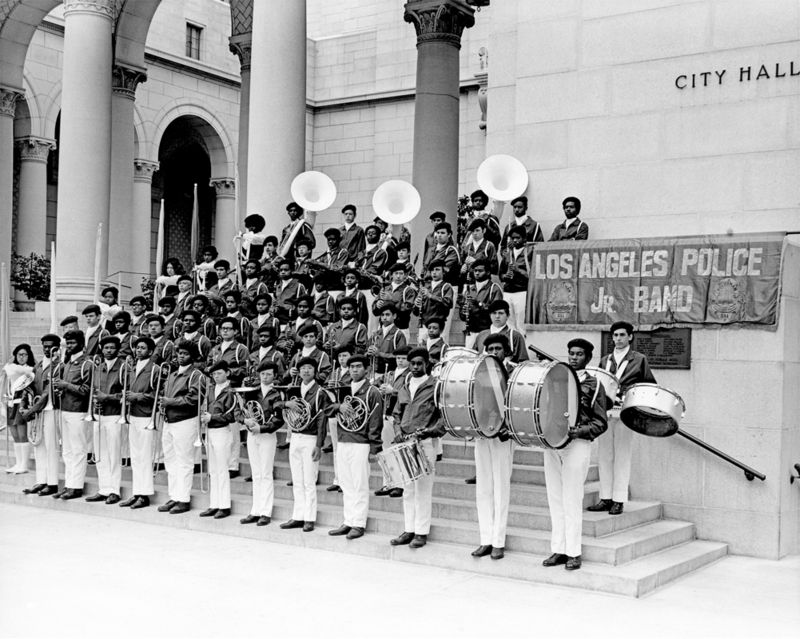 One year there was a conflict because both the band were marching in the Watts Parade. I was threaten with receiving a failing grade if I marched with LAPD Jr Band instead of my high school band. Well, go figure...no-brainer. I marched in many parades all over California, competed in national championships in Oregon and Washington, DC. I could go on and on. Again, nice seeing so many that remember the band. I marched LAPD Jr. Band 73-76 and traveled to San Jose, Chicago and up to Spokane for the World's Fair. These were some of my best times marching. I played French Horn with Doug Matsumoto and Paul Lamb. I then played trumpet with John Gay, Bill Turner, Art Kimbro and many I cannot remember. 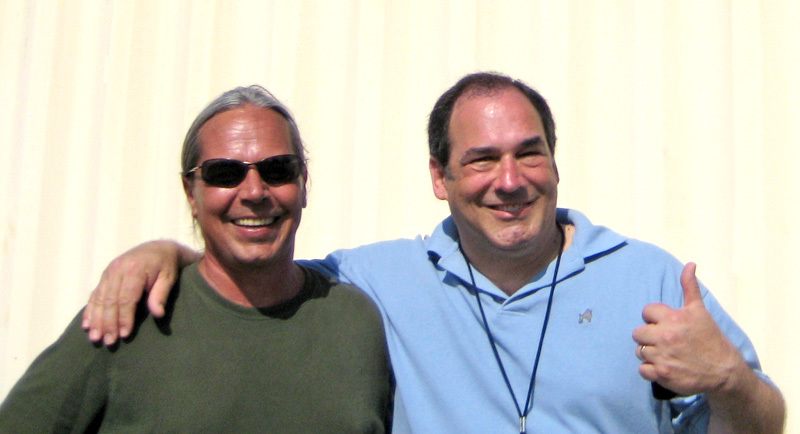 We had a sweet drum line during these years as well, Jon Stewart (drummer for Weird Al), Jon Herron, Eric Doepking. The bus drivers (officer Anderson and officer Wyatt) were nice and made rides fun. Not sure who's still hanging around here, but I was searching for Jr. Band stuff, and this seems like the only cool info on the web. Jon Schwartz here, I was in the drum section with John Herron, Eric Doepking, Matthew Patton, and Bonnie (forgot last name) on timbales. Patrick, I forgive you forgetting my last name, it's been over 40 years! I was in from 1971 to maybe 73, just a short time really. Went to San Jose for State competition, and Chicago for Nationals in August, 1972. Also did Cops & Pops (or two) at the Hollywood Bowl. I remember Tom Stern, Jeff Lamb, Art Kimbro, John Gay, Venita Walton and Rhonda Spaulding in the color guard, and of course Paul Hord (Horde?) And wasn't the drum major Ricky Green? Gary Feldman was the short trombone player, he and I still chat now and then, and along with Bill Turner, we recorded some stuff for the Dr. Demento Show, which led to me meeting Weird Al. I've been his drummer since 1980. Don't laugh. Rather, do laugh. It's a great gig with no signs of slowing down after all these years, and a #1 album was a nice treat back in 2014! Somewhere I have a b&w band photo taken in front of city hall, and another color shot of the band marching - maybe Chicago? - taken from above somehow. Can't make out faces very clearly, but it's a nice shot of the group! I'll find, scan and post one of these days. I have some distorted recordings of bits & pieces of a few rehearsals including One Fine Morning, The Joker, Anderson Tapes and partial cadences & roll offs. Pretty rough performances, you'd never know this was a championship band just a year or two earlier. If there's any interest, I'll post an mp3. Mainly, I've also wondered what happened to Officer Hord, there's almost nothing about him online apart from a passing mention. Last edited by bermuda on Wed May 24, 2017 5:49 pm, edited 2 times in total. Hello all, I was with the band in '64-65. It is good to see that we still "live on". of my young life. I had to ride the bus from the begging to end. The one thing I remember most is when Kelly would say "stop"
There are memories of the Sacramento state championships. The long ride up I-5 on a school bus man it was hot! Does anyone have the record that we made at Pepperdine U in Malibu? I would love to hear that again! Thank all of you for the memories! patrick59 wrote: I marched LAPD Jr. Band 73-76 and traveled to San Jose, Chicago and up to Spokane for the World's Fair. These were some of my best times marching. I played French Horn with Doug Matsumoto and Paul Lamb. I then played trumpet with John Gay, Bill Turner, Art Kimbro and many I cannot remember. We had a sweet drum line during these years as well, Jon Stewart (drummer for Weird Al), Jon Herron, Eric Doepking. John Gragg here - My brother Jeff and I were in the band from about 72 to 74? I remember a TON of what several of you have posted here, including Eric Doepking, Ricky, John and Dean Gay, the Lamb brothers, Officer Hord (or was it Hoard? ), etc. Lots of memories, San Jose State competition, Chicago for Nationals, the buses (we got picked up at York Blvd and Ave 64 at the time. Reading Patrick's thread reminded me of Jon Herron, dude was 'super cool' to us younger kids I seem to remember. Eric was the band clown, but he sure could wail on those drums. I would love it of someone could post or send (trapperjwg@sbcglobal.net) pictures of audio from back then? Also, someone mentioned the EXACT reason I am even looking up this group. I have recently been plagued by the recollection of the marching song we played called "The Joker". I cannot any reference to it anywhere, and it is driving me crazy. Does anyone have an idea of the composer, author, score anything to help me with this? I have been whistling and humming the tune for ages now, and for some reason want to put my hands on the music. Any help is appreciated! Hello to all on this site who we may have played or marched with! On a separate note, Bill Turner passed away yesterday morning (May 23, 2017.) He'd had some severe internal problems and was awaiting a transplant, but was eventually deemed beyond help and went into a hospice facility. I went to visit him yesterday, and missed him by a few hours. I think he was 58 or 59. I've also gotta find the pics of the band on the steps of City Hall, and the great aerial shot of us marching in a parade. It's impossible to make anyone out in this pic, and the bleachers are embarrassingly empty. Thank you very much for your reply! I just today thought of checking this board to see if there were any replies, and YES! And you included pictures! WOW! I was in the Color Guard for Nationals, as I had just recovered from Pneumonia and the Dr. did not want me playing for a few more weeks! Thanks again - Best to you and yours! Thought you might like to know, I bought those sousaphones in 1984 along with all the drums and mellophones when I started my youth band, the Sound Machine of the Inland Empire. In fact I still own a couple of those sousaphones and will be using one this Saturday at a football game. I will keep this conversation alive. I also played in the band, directed by Officer Paul Hord. I played trombone sometime around 1974-75. I remember playing at the Worlds Fair in Spokane Washington. I also remember a few parades. I'd love to hear from you, especially if you remember me. I only knew the guys I went to school with, Dean Gaye, Patrick Reynolds, Joey Aguilar, and who else? I'm still playing trombone. I hope you're still playing too! Hit me up if you ever come to Copenhagen.